It’s rare to find a pop star who inspires just as much virulent hatred as he does fervent support — but Lebanese-born British singer Mika is just that star. Maybe it’s his ridiculously outsized personality, indubitably perfect for a man whose closest artistic influences are Freddie Mercury and Elton John (never the most reserved at a party). Maybe it’s his flamboyantly theatrical music, jam-packed with the kind of sprightly anthems and DayGlo colors that hipsters love to hate. Most likely it’s just the whole package: a wildly creative, bisexual artist who seems to have no inhibitions when it comes to his music or stage presence, yet still sold a stunning six million copies of his debut, largely thanks to mainstream pop fans. Not surprisingly, Mika has done just what many expected him to do on his sophomore effort, again pulling out all the stops in creating a vivacious record fairly bursting with energy, a wagging middle finger to all his detractors and a beckoning to his fans to come indulge in more guilty pleasures. 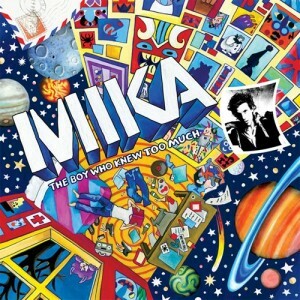 Chances are if you liked Mika before, you’ll love The Boy Who Knew Too Much. The necessary corollary to that, of course, is if you hated Life in Cartoon Motion, there probably won’t be too much to like here. Unfortunately, it is this split in opinion that makes The Boy Who Knew Too Much only a middling success as an album. Although Mika should be commended for creating yet another record of supercharged, operatic pop music — one practically overflowing with bells, whistles and that flawless falsetto — it’s essentially a more polished version of his debut, resplendent in multipart Queen-esque harmonies and Scissor Sisters’ gender-swapping lyrics. From the children’s choir backing of opener “We Are Golden,” to the Elton John piano and tribal drums on “Blue Eyes,” to the bombastic, overly cheesy production on syrupy ballad “I See You,” it’s the best and worst of everything we’ve come to expect from Mika over the course of twelve songs. But put aside Mika’s utter lack of creative restraint and habit of whamming his listener in the skull with his lyrically unvarnished messages, and The Boy Who Knew Too Much reveals the heart and soul of a natural-born songsmith. While there’s nothing here as immediately grabbing as “Grace Kelly,” plenty come close. The best of them come in twos: the double punch of “Blame It On The Girls” and “Rain” comes first, the former dashing into a syncopated piano/handclap stomp and the kind of memorable chorus that even haters will find impossible to ignore, while the latter alternates between trippy verses and a synthtastic chorus that highlights Mika’s spiraling falsetto. “Good Gone Girl” and “Touches You,” meanwhile, are two of the most straightforward pop tunes on the record, featuring the requisite amount of piano, glam-rock choruses and massive hooks that just won’t quit. Best of all, these songs keep the grandiosity to a minimum, instead relying on their effortless melodies and coming out the better for it. It’s a shame that Mika still wastes his time on frivolous exercises like the vapid metaphor of “Toy Boy” and continues to inflate so many good ideas with unnecessary production and hammy performances like “We Are Golden,” but The Boy Who Knew Too Much is nothing if not a pop album that harbors no illusions about itself. Mika will never be the kind of artist to change his style as tastes evolve, and so it’s heartening to hear songs like the haunting electro of “By the Time” and the lounge-y closer “Pick Up Off The Floor,” where Mika teases listeners with hints of what he might be capable of. But then the full orchestra comes in on “Pick Up Off The Floor,” the army of cloned harmonies build up, that falsetto goes where it wants to and we’re left — for better or worse — with the Mika of today.